1841 was not quite the end of the era, but many Edo Era institutions were drawing to a close. For instance. celebrated novelist Kyokutei Bakin was finishing the final installment of his epic multi-volume novel Tale of Eight Dogs, much to the relief and anticipation of his loyal readers. The Tōkei-ji nunnery also still offered sanctuary to abused women seeking divorces, but the Shogun-chartered institution was definitely in the crosshairs of the repressive Edo authorities. Nevertheless, three women will find asylum together, allowing them time to prepare for their very different fates in Masato Harada’s Kakekomi (trailer here), which screens during the 2018 New York Asian Film Festival. Jogo is a skilled ironsmith, whose unfaithful, wastrel husband literally dares her to seek refuge as a Kakekomi, assuming she will be too ashamed of the blisters on her face to venture outside her forge. Somehow, she manages to gin up the courage to call his bluff, finding the encouragement along the way from O-Gin, a well-heeled fellow Kakekomi, who has been injured fighting off bandits. 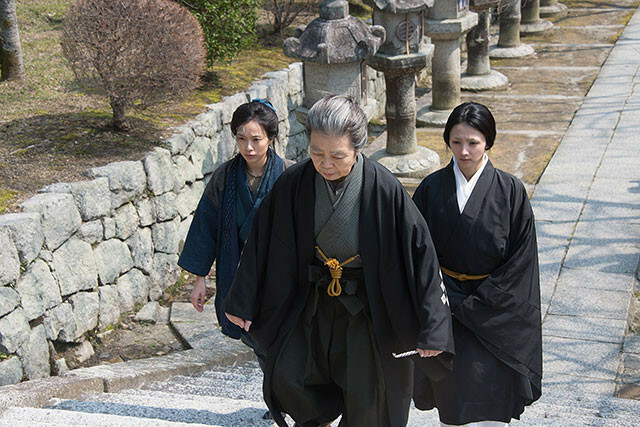 With Jogo’s help, they both reach Tōkei-ji’s receiving inn, where the staff will evaluate their application and prepare them for monastic life. Kakekomi who successfully serve two years as nuns will be granted a divorce regardless of their husbands’ feelings on the matter. Of course, there will be no contact with men, but somehow Shinjiro Nakamura manages to gain entrée now and then, because of skills as a student of medicine. He also happens to be an aspiring novelist, much in the tradition of Bakin, who is a favorite of many Tōkei-ji residents. At least Jogo’s deadbeat husband passively accepts the situation. In contrast, O-Gin’s smuggler common law spouse worries she will betray him to over-zealous Edo authorities. The violent Samurai husband of bushido-bred Yuu Togasaki is even worse, but she intends to use her two years for training, so she can solve that problem permanently. Of course, everyone will have to worry about potential moles sent by the villainous Edo magistrate. 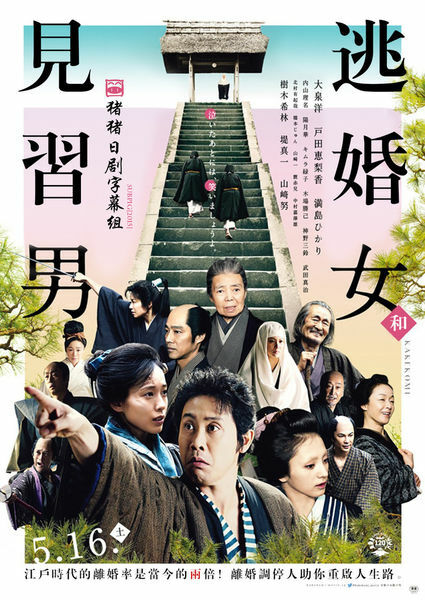 Kakekomi is described many places online as a “drama-comedy,” but we’re hard-pressed to find the funny parts. However, as a straight historical drama, it is totally absorbing and often quite moving. The stakes are very high, but the Kakekomi are necessarily strong characters, who have taken responsibility for their own lives, refusing to live as victims. This character develop arc is especially pronounced and downright inspiring in the case of Jogo. She evolves from a physically scarred shell of a person into a beautiful and commanding woman. Yet, every step of the process is completely believable thanks to the wonderfully subtle and engaging performance of Erika Toda. Hikari Mitsushima, Rina Uchiyama, Misuzu Kanno, and Yuko Miyamoto compliment her nicely as O-Gin, Togasaki, the deeply troubled O-Yuki, and the mole. Women dominate this film for obvious reasons, but Yo Oizumi memorably plays Nakamura with a light touch, without resorting to shtick or buffoonery (we suppose he accounts for the comedy, as when he warbles a subversive ditty, openly defying to Edo’s ban on public singing). More to the point, there is an effortless naturalness in the way the chemistry builds between him and Toda’s Jogo. Tsutomu Yamazaki also plays Bakin with a wry presence and imposing stature worthy of vintage Orson Welles. There are a lot of strands in Kakekomi, but Harada satisfyingly brings them all together in a way that is so logical, it feels like it was fated from the start. The combination of new beginnings and final exits is quite bittersweet, totally in keeping with a film set in a Buddhist nunnery. It really is an unusually graceful and humanistic film. Very highly recommended, Kakekomi screens Sunday afternoon (7/1) at the Walter Reade, as part of this year’s NYAFF.